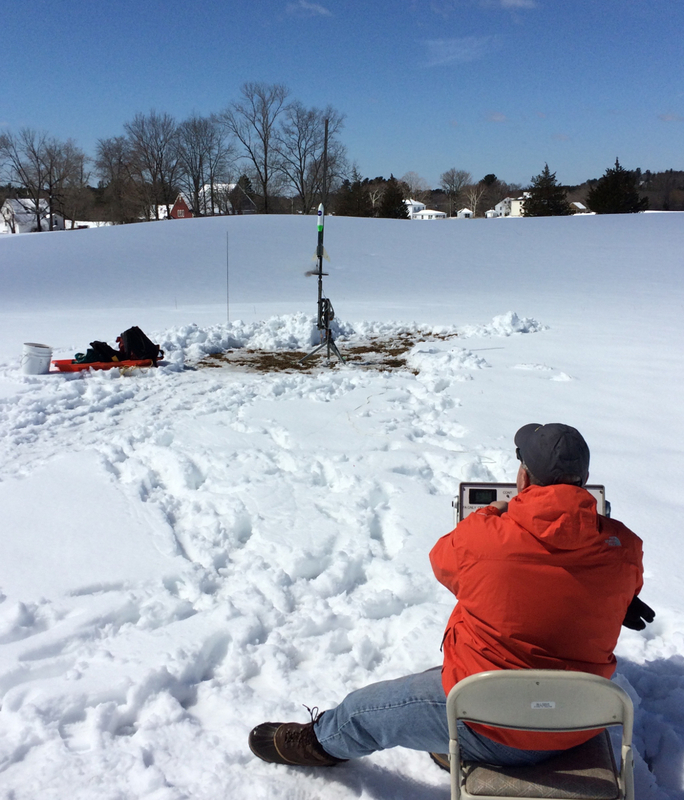 A traditional New England April Fools’ Day snow storm caused our final TARC launch of the year to be postponed a day. Nonetheless, Sunday, April 2nd, was a beautiful sunny day, although the snow was deeper than two weeks ago when it was still officially winter. We had seven teams launching and while, as expected, most were making qualification attempts, two did not. Qualification attempts were made by Minuteman Vocational High, Fairhaven Rec Center, Shrewsbury High, Maine Central Institute High, and Wavelet Technologies. Cambridge Science Club for Girls had already made their qualification flights, but showed up just to get some more flights in. Newton South High arrived with a rocket that was unable to meet the requirements so we couldn’t allow it to make a qualification flight. They reported it was built entirely from scrounged materials; total cost, including motors: $17. Held together with masking tape and hot glue, the rocket featured tube fins that ran the length of the body (made from uncut paper towel tubes). In spite of questions about its stability, we allowed the rocket to fly as a “heads up” flight. Flying with an Estes F15-6, the rocket rose a safe distance overhead before meandering about the sky under a long gentle burn, eventually hitting nose first before the parachute ejected. After the rocket was retrieved, the thoroughly scrambled egg was visible from within the plastic champagne glass nose cone. The post launch review was held at The Barking Dog in downtown Amesbury,followed by an ad-hoc retreat to Stillwell’s Ice Cream, also in downtown Amesbury. Launch photos are in the Gallery.